Warning: Lots of pictures coming up. Start with a new design, make sure you have a Relational Model to import to. Now go to the file menu and start the import. You can import existing connections from Oracle SQL Developer if you have them – note that you need v4.0.3 of the modeler in order to bring over the passwords. To create a new connection, put in your username, etc. You can test your connection before you hit ‘Ok’ if you want to save yourself some time in case you made a mistake. 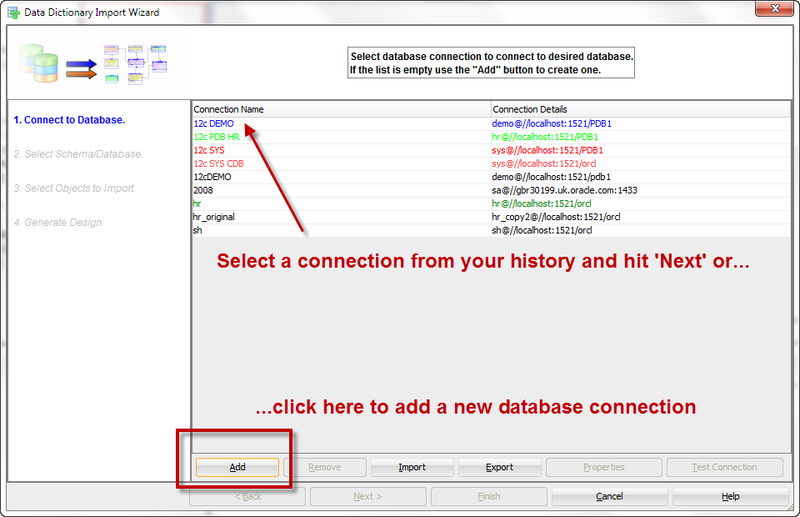 Want to import from SQL Server (or DB2) instead? Check out this great post from Oracle ACE Director @kentgraziano on how to get SQL Server connectivity going in SQL Developer Data Modeler. You can set some import options here – if you have TONS of partitions – skip them and save a bunch of time. Does this look right? If so, hit the ‘Finish’ button. Your model now has the database objects, and here’s a log reminding you what was imported and when. Don’t forget to save your design! Ok, it’s saved. But now maybe you want to add it to your design repository for change tracking and source control? Did you notice we got a SubView for each Schema we imported from? Make the diagram look ‘nice’ – rearrange objects, change color schemes, etc. Add your design to Subversion. I tried this step by step. First with HR database and it was working fine and i got ERD and later i got the logical model. When i tried to apply the same steps on my one of databases at work. It generated just boxes with no relations. I’m afraid it’s because your databases at work don’t have any foreign keys. Thanks for the quick reply, I really appreciate it. I do have some fields with the same name in the tables and that I usually use to do a join. Is there anyother way i can make a data model for this ? Try this – DISCOVER FOREIGN KEYS. Again, I suspect that some grants/privileges are missing. Can you give me a hint which objects are accessed during this step?